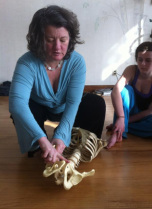 Join Christine Cole for an in-depth exploration of developmental movement, embodiment and bodywork. Dec 8, 9-6pm, Intermediate Level, with guest teachers!!! Next workshop is March 1-3rd: Embodying Evolution with Developmental Movement, and another workshop with Christine May 3-5th. Workshops in Burlington, St. Johnsbury, and Bethlehem NH coming soon. In addition to featuring great yoga and music, this summer's festival will also feature the brand new Wanderlust Expeditions outdoor activities program, Wanderlust Farm to Table Dinner, Soulful Cinema, Speakeasy talks, and AcroYoga. I enjoyed learning Slackline Yoga, engaging in primal conditioning, and dancing. (Sundays: Class 10am-11am, Jam 11am-noon). $5-10 sliding scale (includes jam). Jam $3-5. Contact Improvisation is a dance technique in which points of physical contact provide the starting point for exploration through movement improvisation. In class you will learn to cultivate your awareness and listening skills and learn how to find ease in your movements and safely move with another. We are passionate about this dance form and would love to share it with you. It is accessible to all levels, even those with limited mobility. Try it once and see if it is for you. Come and observe a jam and enjoy the performance. Let's inhabit the softest parts of our bodies and practice gentleness and ease. Let's explore the exquisiteness of subtle movement and practice safe ways to share and receive weight. During this all levels class we will practice articulating: how we are doing, what we are open or closed to exploring, and how we invite or decline weight sharing on a physical/non-verbal level. We will practice listening with our eyes, ears and through our skin. As we deepen our awareness and articulation of subtle body language we will practice being authentic to our own dance while also meeting another mover and a room full of movers. This class includes activities in contact improvisation, partner yoga, and experiential anatomy. Each class is $15. Sign up for both for $25. Sign up by Nov 28th for both classes for $20. All must register by December 2nd with Abbi at abbi.jaffe@gmail.com or 318-3927. June 11-15, 2012: 5:30-7pm, 7-7:30 additional practice time ($60). Find ease of movement practicing safe ways to share and receive weight; cultivate awareness and listening with eyes, ears, and skin; be authentic to your own dance while moving with others. For all levels, including those with limited mobility (though the workshop is held on the third floor without an elevator). Includes a 20 min 1:1 session with Abbi, to be scheduled. Facilitated by Abbi Jaffe and Jen Cherkasov. This class is not currently running. If it interests you, please let me know. All Levels! Learn how to play on Aerial Fabric or deepen your current practice. Learn therapeutic and acrobatic Flying Yoga. Visit Elana's website for more information. just let us know and we will try to accommodate you. DanceAbility has been researched and taught internationally since 1987. I wanted our community to have the opportunity to experience this work. Liza is recently certified in DanceAbility, and while Liza does not live on the East Coast, I asked her to visit Vermont to share DanceAbility. DanceAbility is improvisation and dance to promote play and connection for people of all abilities. These workshops are for anyone who loves creative movement and community and who wants to explore and uproot misconceptions and prejudice between people with and without disabilities. DanceAbility workshops provide a supportive atmosphere for attitudes to change, and for people to learn about the beauty and joy of communicating through movement. DanceAbility's mission is to cultivate a common ground for creative expression for all people with regard and regardless of physical abilities, economic status, age, or race. The workshop material is drawn from the group present in a given situation and isolates no one. The method supports self-empowerment by offering ways that all individuals can participate fully in expressing their creative choices, including respecting one's own limits. Following one's own interest and desire, and applying that to the benefit of one's community, is a basic DanceAbility teaching. Recently DanceAbility was commissioned by the Colombian Government to support their Veterans. I am totally inspired by the possibilities of this work and I think you will be too. "I traveled a long way to learn DanceAbility because this kind of work does not exist in Argentina. I want to understand my own body better and understand more deeply other people's bodies and make people in Argentina conscious of the possibilities." ~Marina Gubbay, a dancer who had a stroke affecting her right arm and leg. Learn more about DanceAbility by clicking here. life. No sense of humor or yoga experience necessary. Together we create a tribe that embraces balance, joy, courage, agelessness, appropriate risk, and transformation. CircusYoga is an imaginative, fun-filled experience designed to strengthen self-confidence, focus, trust, and teamwork. CircusYoga combines the consciousness of yoga with the communal ceremony of circus. Participants will open new realms of vocabulary for play and communication through: Mandala Yoga, Partner Acrobatics, Juggling, Clowning & Physical Comedy, Flying Partner Yoga, Group Story-Creation, Thai Massage, and Creative Movement & Dance. For more info on CircusYoga, click here.